Erste „normale Woche“ – first „normal week“ – China, here I come! Ich arbeitete hauptsächlich in der Bibliothek, da ich im Zimmer ja noch kein Internet hatte und fror dabei ziemlich. Die Temperaturen waren Anfang März noch ganz schön niedrig und Heizungen gibt es nicht. Steife Finger nach einigen Stunden in der Bib waren eine ganz neue Erfahrung für mich.
Am Mittwoch erhielt ich mein erstes monatliches Stipendium. Da ich kein Bankkonto hatte erhielt ich das Geld in bar und das wird auch weiterhin so sein. Da ich mein Konto nicht bei der richtigen Bank eröffnen konnte, würden für die Uni Überweisungskosten anfallen, also werde ich das Geld jetzt einfach einzahlen. Auch gut! Am D onnerstag probierte ich zum ersten Mal das wunderschöne Café an der Uni (Bild oben). Der Matcha Latte lässt Hipsterträume wahr werden und auch der Cappuccino schmeckt wunderbar! Kaffee ist hier leider immer ziemlich teuer und der Cappuccino kostet 15 Yuan, also umgerechnet ca. 2 Euro. Eigentlich normal, aber für das hiesige Preisniveau doch recht kostspielig. Ich werde mir trotzdem öfter mal ein Heißgetränk hier gönnen, da das Café bequeme Sitzgelegenheiten bietet und ich hier schön sitzen und in meinem Blog schreiben kann. 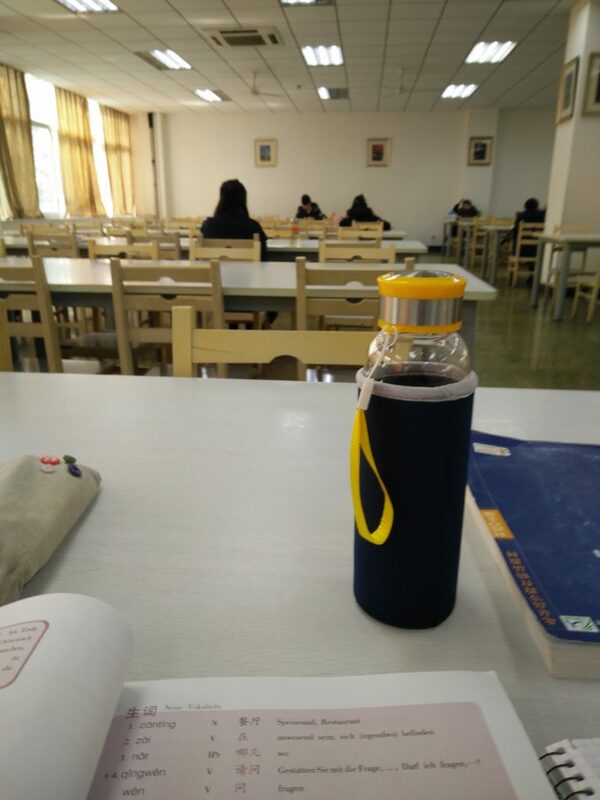 My second week at uni was my first „normal week“ and I spent the biggest amount of time writing a paper for the course „Social and Web Intelligence“ of my home university. I have to admit that it was a little annoying that I had to do this, because I much rather wanted to go out and explore something. I mostly worked in the library, because I did not have Internet access in my room. The library, as basically any other room here, does not have heating and the temperatures were quite low in the beginning of March. I was quite cold and my fingers got a little stiff after several hours of sitting and writing. New experiences everywhere. 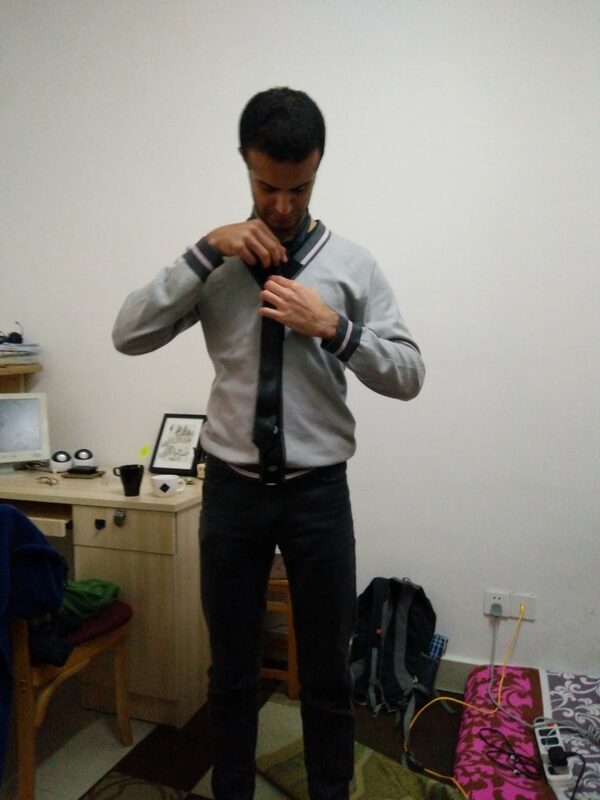 I helped my friend Omar to prepare for an interview. After his graduation he would like to work in an international hotel and had an interview at Chongqing Intercontinental coming up. We worked over his CV and made sure his outfit was perfect. Waleed, another Yemenis, Omar and me were watching quite a few YouTube videos on “how to tie a tie” to improve our skills. On Wednesday I received my monthly scholarship money in cash. I have a bank account by now, but I will keep getting the scholarship in cash to avoid transactions fees for the university (the “right” bank did not give me an account). Does not really matter to me, because I can just pay the money in if necessary. On Thursday I tried the wonderful café situated on campus for the first time (picture above). 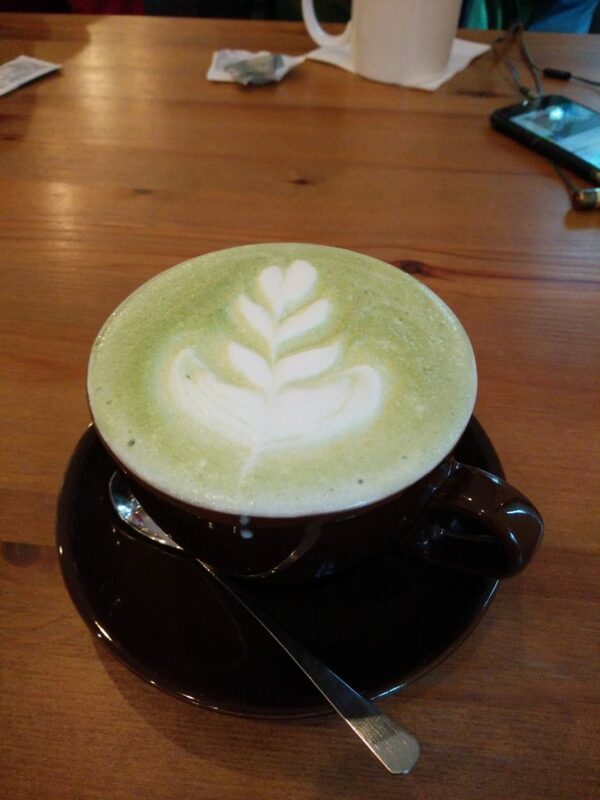 The Matcha Latte is perfect, as is the coffee. In China coffee is rather rare and relatively expensive, too. A cappuccino costs 15 Yuan, which is about 2 Euro. This is normal for Germany, but compared to the other prices here quite costly. Nevertheless I am sure that I will come here often in the future, because the café offers a comfortable and quiet working atmosphere. Perfect to write new blog articles.